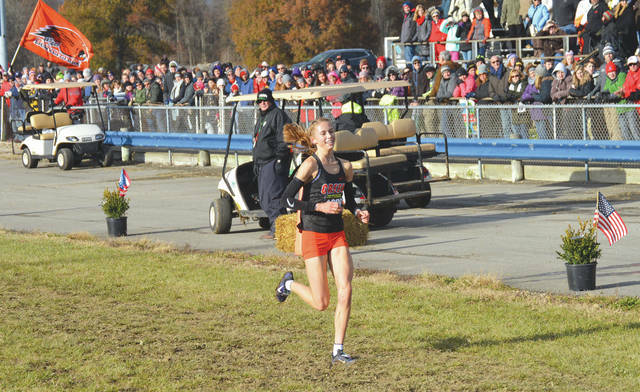 With the Beavercreek High School banner waving and all eyes upon her, junior Taylor Ewert smiles as she heads to the finish line to win the girls Division I state cross country individual title, Nov. 10, at National Trail Raceway in Hebron. The entire Beavercreek High School girls cross country team celebrates on the awards podium after winning the Division I girls team title, Nov. 10 in Hebron. 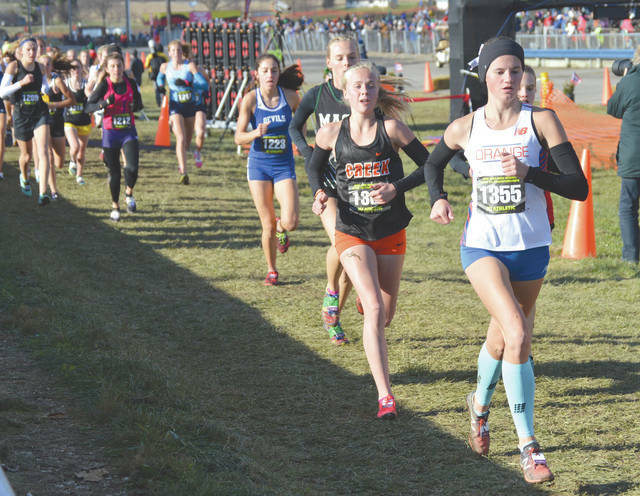 Beavercreek junior Savannah Roark placed 16th overall to finish on the awards podium for the state-title winning Beavers, Nov. 10 at National Trail Raceway in Hebron. Sophomore Ethan Wallis of Cedarville placed 15th overall in the boys Division III state cross country event. 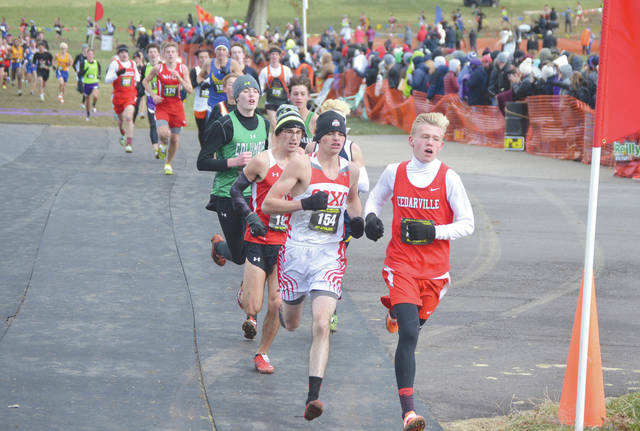 The Cedarville boys team also placed 15th, in what is believed to be the school’s first-ever state championship boys team competition of any kind. Carroll junior Grant Arnold (headband, 688) placed 91st as the lone Greene County area runner in the Division I boys race, Nov. 10 in Hebron. 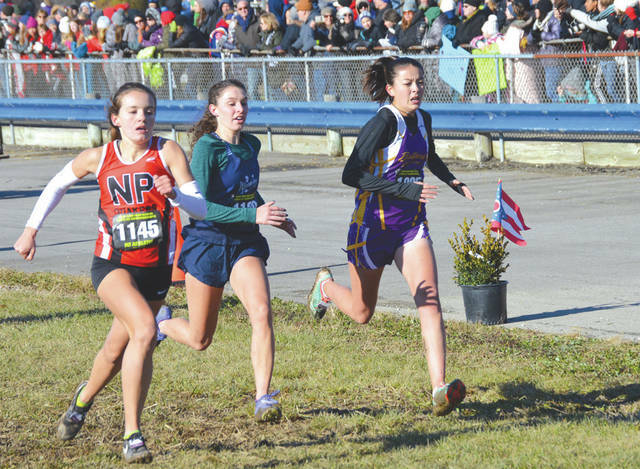 Bellbrook senior Minami Ford (far right) battles with Riley Bahr of Cincinnati Wyoming and New Philadelphia’s Rachel Anderson as they approach the finish line in the girls Division II state championship race, Nov. 10 in Hebron. Bellbrook placed third as a team and Ford was the Golden Eagles’ top finisher. 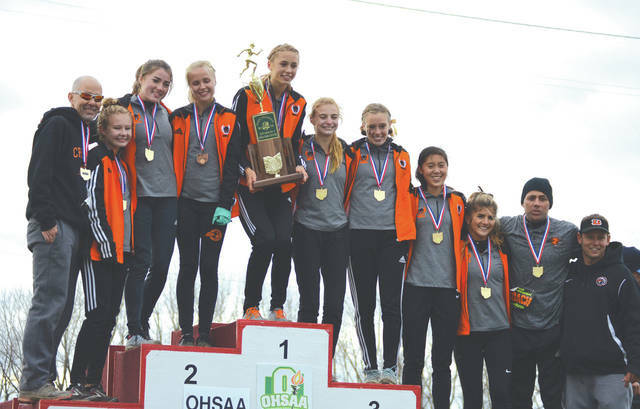 HEBRON — Taking a cue from their girls soccer counterparts, the Beavercreek girls cross country team won a state title of its own on Saturday, Nov. 10, just a day after the soccer team had won a Division I title. Beavercreek junior speedster Taylor Ewert led from start to finish to claim the Girls D-I individual crown for herself with a time of 17 minutes, 38.7 seconds over a very muddy and slippery course. Teammate Savannah Roark ended her season on the podium as a top-20 finisher, placing 16th, and teammates Juliann Williams, Jodie Pierce, Emma Johnson, Kendall Hobbs and Bently Barrett also ran strong to claim the school’s second girls state cross country title ever. “I’m overcome with joy. I know that we had been (ranked) in first place, but to do it in the biggest race, we knew we had to race Centerville and everybody else. It was a team effort. I knew Taylor would do her thing, but I’m just really proud of all the girls,” Beavercreek girls coach Howard Russ said. Russ said the team was inspired by the girls soccer team’s state championship win over Strongsville the night before. Despite the bitter cold weather, and a race run on a slippery and very muddy course, Ewert won the event by almost a full 26 seconds over the second-place finisher. The only other time the Beavercreek girls had won a team cross country title was 1994. Moments after the girls D-II race, Bellbrook teammates Minami Ford and Emily Pelfrey were seen consoling each other. 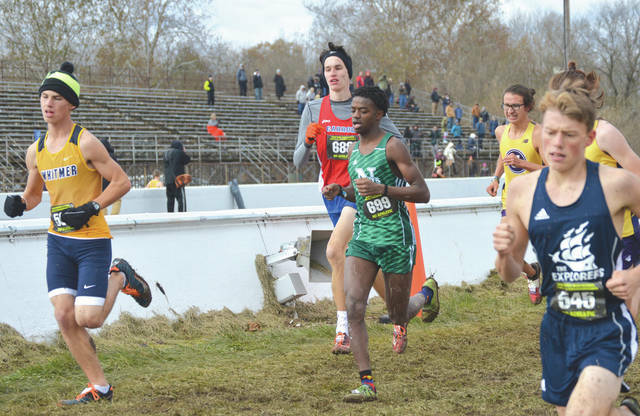 They didn’t think they had run as well as they should have in the state race … until they were informed that the team had placed a school-record best of third overall. The tears flowed and the two embraced in cheer. Assistant coach Blake Barnes said Bellbrook’s previous best at state was a sixth place finish. “And they just topped that,” he said. “It’s tough to realize how well you did at the state meet, because there might be so many girls finishing in front of you. It has the tendency to feel like you did really, really bad, but in fact there’s a lot of really fast individuals out here today, those kids are supposed to be in the front. In the boys races, Ethan Wallis led Cedarville by placing 15th overall in a time of 16:59.3. The Cedarville team placed 15th overall. Carroll’s Grant Arnold was the lone Greene County area competitor on the boys Division I race, finishing 91st.